1998 Moonlight's A Lot Of Trot- (Chestnut Colt by T. S. Wild Bourbon)- 2010 Blue Ribbon Fall Classic County Charity Walk & Trot Champion. 2011 IASHA Spring Warm-Up Walk & Trot Champion. 2011 Heartland Classic Walk & Trot Pleasure Reserve Champion. 2012 Heartland Classic Walk & Trot Pleasure Champion. 2012 Blue Ribbon Fall Classic Walk & Trot Pleasure Champion. 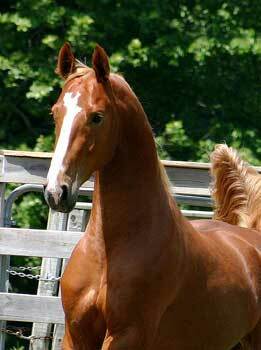 2004 Winsdown Golden Triangle- (Chestnut by Winsdown Hi Octane) 2007 Germantown UPHA 5 Gaited Champion. 2008 UPHA Chapter Eight 5 Gaited Reserve Grand Champion. 2009 UPHA Chapter Fight 5 Gaited Show Pleasure Reserve Grand Champion. 2009 Asheville Invitational 5 Gaited Show Pleasure Champion. 2009 Morristown 5 Gaited Show Pleasure Limit Rider Reserve Grand Champion. 2009 ASHA 5 Gaited Show Pleasure Award for TN. 2009 ETSA 5 Gaited Show Pleasure Horse High Point Award. 2010 Clemson Fall Classic 5 Gaited Show Pleasure Reserve Grand Champion. 2010 UPHA Chapter Eight 5 Gaited Show Pleasure Reserve Grand Champion. 2011 Morristown Charity 5 Gaited Show Pleasure Limit Champion. ETSA Spring Classic 5 Gaited Show Pleasure Champion. 2012 Kentucky Spring Premiere 5 Gaited Show Pleasure Novice Champion. 2012 Germantown 5 Gaited Ladies Grand Champion. 2013 UPHA Chapter Eight 3 Gaited Country Pleasure Adult Grand Champion. ETSA Midsummer Classic 3 Gaited Country Adult Reserve Grand Champion. 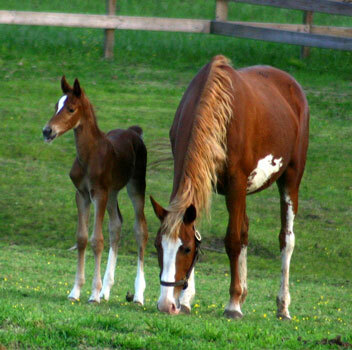 2005 Winsdown West End- (Chestnut Mare by Winsdown Hi Octane) 2005 Iowa Futurity Weanling Grand Champion & Weanling Filly Champion. 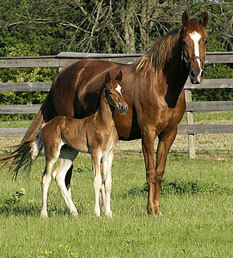 2005 Minnesota Futurity Amateur Weanling Grand Champion and Reserve Amateur Weanling Filly. Harbour Night (AKA After Night Delight) by WGC Sire Folly's Night Flyer- 1982 Santa Anita National Fine Harness Reserve Champion. Vanity's Night Folly- (4 SBR CH Points) 1985 Ohio State Fair Weanling Colt Reserve Champion. 1986 Lawrence County Yearling Champion. 1986 ASHB Futuirty of Michigan Yearling Reserve Grand Champion. 1987 ASHB Futurity of Michigan Champion. 1987 Buckeye Futurity 2 Year Old Under Saddle Champion. 1988 UPHA Fine Harness Champion. 1989 Ohio State Fair Fine Harness Junior Champion. 1990 Kentucky Fall Classic Fine Harness Reserve Champion. 1992 Indianapolis Charity Pleasure Driving Champion. October 1992 Exported to Germany. Rare Memories- 1990 South Florida Charity 5 Gaited Novice Reserve Champion. 1990 Tampa Charity 5 Gaited Florida Owned Reserve Champion. 1990 Seminole Charity Pleasure Driving Champion. 1993 Southwestern Expo 5 Gaited Jr. Ex. Grand Champion. Chippendale AT- 1997 UPHA Almost Summer Country Driving Jr. Ex. Champion. Kassandrakalu- 1990 3 Gaited Jr. Ex. 13 & Under Champion. 1990 Blowing Rock Charity 3 Gaited Jr. Ex. Reserve Champion. Noble Decree- 1989 WV State Fair 3 Gaited Amateur Grand Champion. 1993 River Ridge 3 Gaited Country Limit Reserve Champion. Hi Reality- NC State Fair 3 Gaited Limit Champion. 1987 Blowing Rock 3 Gaited Ladies Reserve Champion. King's Mr. Kalu- 1994 Eastern States 5 Gaited Show Pleasure Grand Champion. King's Keepsake Jake- 2002 Asheville Lions Pleasure Pony Reserve Champion. 2003 J D Massey 3 Gaited Show Pleasure 18-35 Reserve Champion.2003 NC State Championship Pleasure Pony Grand Champion. CH Inflation SL- 1985 Memorial Day Classic 5 Gaited Pleasure Champion. 1985 California Futuirty 5 Gaited Pleasure Champion. 1987 CARES 5 Gaited Pleasure Limit Horse Champion. 1987 Channel City 5 Gaited Pleasure Limit Champion. 1988 Santa Barbara 5 Gaited Pleasure Limit Horse Champion. 1988 California Futurity 5 Gaited Pleasure Limit Horse Champion. 1989 Santa Barbara 5 Gaited Pleasure Limit Horse Champion. 1990 Holywood Charity 5 Gaited Jr. Ex. Grand Champion. 1990 Del Mar National 5 Gated Jr. Ex. Grand Champion. 1990 Charity Fair 5 Gaited Jr. Ex. Grand Champion. 1990 California Futurity Jr. Ex. Grand Champion. 1991 Hollywood 5 gaited Jr. Ex. Grand Champion. 1992 Hollywood Benefit 5 Gaited Jr. Ex. Grand Champion. 1992 Monterey Springfest 5 Gaited Jr. Ex. Grand Champion. 1992 Charity Fair 5 Gaited Jr. Ex. Grand Champion. 1993 Chairty Fair S&B Shatner Western Champion. 1994 Carousel Western Champion. 1994 Sierra Gold Western Grand Champion. RWC Flame Thrower (AKA All Flame)- 1985 New York National 5 Gaited Amateur Stallion/Gelding Champion. 1986 California Futuirty 5 gaited Limit Champion. 1986 Arizona Futuirty 5 Gaited Grand Champion. 1987 KSF RWC 5 Gaited Jr. Ex. 1988 Rick Creek 5 Gaited Jr. Ex. 14 & Under Reserve Champion. 1989 Mercer County 5 Gaited Pleasure grand Champion. 1989 Kentucky Fall Classic 5 Gaited Pleasure Reserve Champion. 1994 Roanoke Valley 5 Gaited Ladies Reserve Champion. Dollar's Worth- UPHA Spring Premiere 3 Gaited Country Adult Grand Champion. Worthy's Rose Dream- 1998 Children's Benefit UPHA 5 Gaited Champion. 1999 UPHA Spring Premiere 5 Gaited Junior Champion. 1999 KSF Ribbon Winner. 2000 UPHA Spring Premiere 5 Gaited Champion. 2000 Twin States 5 Gaited Amateur Grand Champion. 2000 Syracuse 5 Gaited Grand Champion. 2001 UPHA Spring Premiere 5 Gaited Champion. Caramac's Catrina (AKA Homegrown)- 1998 KSF 2 Year Old Fine Harness Top Three. 1999 KSF 5 Gaited 3 Year Old Mare Top Three. 2001 Indianapolis Charity 5 Gaited Novice Rider Champion. 2001 ASHAM 5 Gaited Amateur/Jr. Ex./Novice Champion. Worthy's Just Once- 2000 Children's Benefit 2 Year Old Fine Harness Champion. 2000 KSF Ribbon Winner. 2000 ASHAV 2 Year Old Fine Harness. 2002 KSF Ribbon Winner. 2004 Kentucky Fall Classic Country Driving Reserve Grand Champion. 2005 Blowing Rock Youth Challenge Driving Champion. 2005 KSF Ribbon Winner. 2005 NC State Championship Youth Driving Champion. 2006 Raleigh Spring Youth Driving Champion. 2006 Carolina Classic Country Driving Champion. 2007 Raleigh Spring Youth Driving Champion. 2008 ASHAV W/T 12 & Under Grand Reserve Champion. 2009 Old Dominion Futurity Benefit Spring 3 Gaited Show Pleasure Adult Reserve Champion. 2009 ASHAV 3 Gaited Show Pleasure Jr. Ex. Reserve Champion. 009 Old Dominion Futurity Benefit Fall 3 Gaited Show Pleasure Adult Reserve Champion. 2010 Asheville Invitational 3 Gaited Jr. Ex. Champion. 2010 ETSA 3 Gaited Show Pleasure Alpha/Novice Champion. Fraiser Crane- 2008 Ashevlle Spring 3 Gaited Show Pleasure Maiden Champion. Roseridge's Go With The Flow- 2006 St. Louis UPHA 5 Gaited Reserve Champion. 2007 FASH 5 Gaited Junior Reserve Champion. 2008 Spring Tune Up 5 Gaited Champion. 2009 FASH 5 Gaited Amateur Reserve Champion. 2010 Minnesota State Fair 5 Gaited Reserve Grand Champion. Roseridge's Bell- 1997 ASHAV 2 Year Old Fine Harness Champion. 1998 Bonnie Blue 5 Gaited 3 Year Old Champion. 2001 Pin Oak Fine Harness Champion. 2007 SASHA Country Driving Grand Champion. 2009 SASHA Country Driving Grand Champion. 2009 SASHA Country Driving Grand Champion. Finally Free- 2005 Rock Creek 5 Gaited Junior Stallion/Gelding Champion. 2007 ASHAV 5 Gaited Pleasure Reserve Grand Champion. 2008 Blue Gray 5 Gaited Pleasure Adult Reserve Grand Champion. 2008 summer Challenge Of Champions 5 gaited Pleasure Grand Champion. Sacred Son- 2008 UPHA Spring Premiere UPHA Park Pleasure Champion. 2008 Twin States Park 3 Year Old Champion. 2009 Children's Benefit 3 Gaited Show Pleasure Jr. Ex. Reserve Grand Champion. 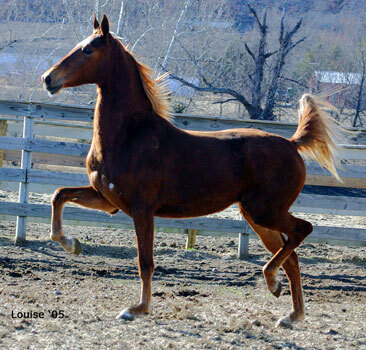 Worthy's Sonshine- 1999 Roanoke Valley 5 Gaited 3 Year old Champion. 1999 KSF 5 Gaited 3 Year Old Stallion/Gelding Top Three. 2001 Roianoke 5 Gaited Novice Reserve Champion. 2001 NC State Fair 5 Gaited Ladies Champion. 2002 ASHAV 5 Gaited Ladies Grand Champion. 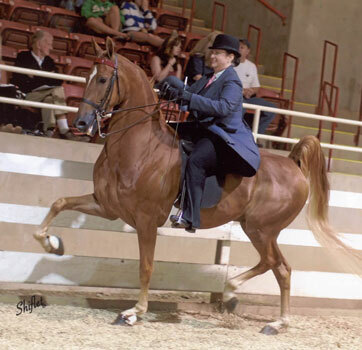 2003 ASHAV 5 Gaited Ladies Champion. 2003 NC State Fair 5 Gaited Ladies Champion. RWC CH Sweetest Victory (AKA Foxfire's Victory and Kandy Kane SL)- 1986 Rock Creek 5 Gaited 3 Year Old Reserve Champion. 1987 Devon 5 Gaited Junior Champion. 1987 4 Year Old 5 Gaited Sweepstakes Grand Champion. 1988 Rock Creek 5 Gaited Ladies Gelding Champion. 1988 Lexington 5 Gaited Ladies Gelding Champion. 1988 Kentucky Fall Classic 5 Gaited Ladies Gelding Champion. 1990 Wisconsin Futurity 5 Gaited Amateur Champion. 1991 Tanbark Model Champion. 1992 Wisconsin 5 Gaited Pleasure Grand Champion. 1995 Nebraska Charity 5 Gaited Pleasure Grand Champion. 1995 Windom 5 Gaited Pleasure Champion. 1996 Des Moines Spring 5 Gaited Jr. Ex. Grand Champion. 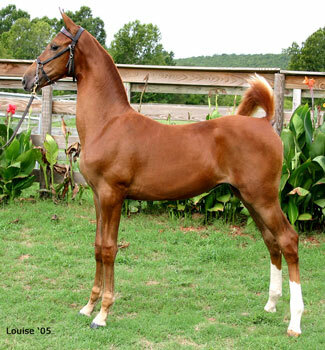 Starkon's Kala- Missouri Futurity Yearling Filly Reserve Champion. Georgia Brown LS- 1986 Madison Charity 5 Gaited Amateur Reserve Grand Champion. 1987 Boone County Fair (MO) 5 Gaited Amateur Grand Champion. 1988 Boone County Fair 5 Gaited Amateur Mare Champion. WC CH Fury (AKA Remember Fury)- 1991 ASHAV 3 Gaited Country A/O/T Champion. 1996 ASAW Summerfun Park Grand Champion. 1997 Des Moines Spring Park Grand Champion. 1997 Park Amateur Grand Champion. 1997 Tanbark Park Grand Champion. 1997 KSF WC Amateur Park Horse. 1997 Minnesota Futurity Park Grand Champion. 1998 Oklahoma Centennial Park Grand Champion. 1998 Milwaukee Spring Park Grand Champion. 2001 Wisconsin Park Amateur Grand Champion. 2002 Wisconsin Futurity Park Amateur Grand Champion. 2005 Tanbark Park Grand Champion. RWGC and WC sire Prize Contender- 1994 NC State Championship 5 Gaited Reserve Grand Champion. 1995 NC State Fair 5 Gaited Grand Champion. 1996 NC State Fair 5 Gaited Grand Champion. 1997 Lexington 5 Gaited Stallion Champion. 1997 KSF 5 Gaited Stallion Stake Top Three. 1998 River Ridge 5 Gaited Grand Champion. 1998 Lexington 5 Gaited Reserve Grand Champion. 1998 All American Classic 5 Gaited Grand Champion. 1999 American Royal 5 Gaited Grand Champion. RWC Time To Boogie- 1998 ASHAV 3 Gaited Virginia Owned Champion. 1999 All American Classic 3 Gaited Novice Champion. 2000 KSF 3 Gaited Ky. Co. Fair Reserve Champion.